This is the third in a series of blogs on new and emerging technologies’ impact on higher education. The first part is here and the second part is here. Some of the information found herein is based on the NMC Horizon Report 2016. In this blog I’ll be discussing the very exciting technologies of Virtual Reality (VR) and Augmented Reality (AR). The estimated time for mainstream adoption in higher education of these technologies is 2-3 years. Virtual reality is a computer technology which replicates an environment and provides a simulation of a users’ presence within it. That user can then interact with that environment. You might agree that talk of VR has become so ubiquitous over the last decade and more that there’s no point in providing that definition. However, I think to appreciate this particular iteration of the technology, we have to remember precisely what it is. This is not simply a game facilitated by new devices such as the Oculus Rift; this is a technology that can put us in a new, imagined reality. A replication of something real or something imagined and the opportunity to perform actions within that virtual environment that we might not be able to or simply not want to do in the real world. While I am a very avid gamer, here we’re concerned with VR’s application in learning. What drives its use and what positive learning innovations are possible through its adoption within mainstream higher education. The immersive experiences with vision, sound, and even touch now with the technology of haptic gloves, which give users the sensation of feeling virtual objects, of VR give educators the opportunity to create environments where learners can engage in deep learning. Where they can put into practice the theory they have learnt. Why do air forces and organisations such as NASA use virtual simulations in training? It’s because we can create situations where failure and innovation can occur but the negative consequences of error are not catastrophic. Not only can we create realistic simulations of the real world, but we can create worlds where the only limits are our own imaginations. Participants using the technology can be thrown into any world or universe and be faced with any situation where they can react accordingly. They learn so much more effectively when the situation is feels real. This is authentic learning that simply can’t be accomplished in traditional settings using books and discussion. This is one of the technologies that can enhance learning but also bridge the gap for online learning to a place where there are enhanced group dynamics, peer-to-peer learning, and increased motivation for learners. Bringing it closer its bricks and mortar equivalent. Imagine a language learning class where participants from all over the world can convene in a virtual forest. Guided by an instructor, they are invited to name and describe the wildlife and fauna they encounter. This is not a new use of virtual worlds; it has been used with applications such as Second Life in the past, but this new generation’s technology and graphics capabilities mean that those worlds are far more immersive and rich in detail, creating something far more realistic. I have written about the import of making learning as realistic as possible in conjunction with the kind of scenario-based learning that can be created for Virtual Reality learning scenarios in this previous blog. 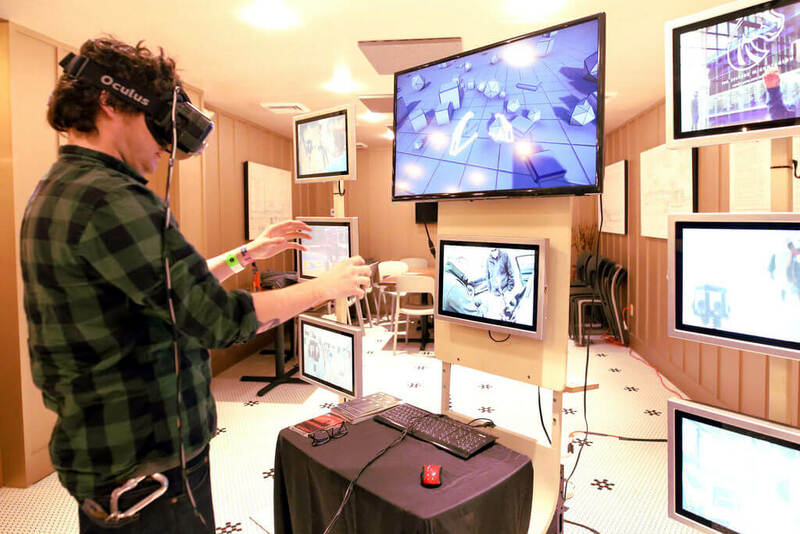 Stanford and MIT have VR learning environments which simulate on-campus facilities where students can network, communicate, and work on group projects. Facebook (owners of Oculus VR) emphasise the social aspects of VR and are introducing a new VR platform in 2016. While the latter example isn’t strictly an example of VR use in an educational context, it does speak to one of the crucial aspects of VR. It provides virtual spaces for users all over the world to congregate, share ideas, and collaborate. This, in essence, is what university life is designed for. In addition to the acquisition of knowledge, universities bring together like-minded individuals that can collaborate and learn more effectively by creating communities of practice. VR can place learning in contextual settings where new knowledge is applied in conjunction with learners all over the world. A cost-effective and accessible VR solution? Many might understandably scoff at the use of VR outside of well-funded western universities. However, there are always innovations that make these technologies more accessible. Take Google Cardboard for example. This is a simple but brilliant cardboard headset into which a smartphone can be inserted so that users can engage with VR applications uploaded to the phone. Here’s a quick video created by the very talented Anthony Burke from Pixel Boxer explaining Google Cardboard’s possible applications. Augmented Reality, or Blended Reality, is the computer-generated augmentation of a physical real world environment. It is the combination of the real world with virtual objects which can be viewed through digital devices such as tablets or smartphones or purpose-built technologies like Microsoft’s HoloLens. The benefits and what’s driving the adoption of AR are very similar to those of VR in that they offer the opportunities for more authentic learning in scenarios that may not be possible in the real world. For example, let’s say a trainee surgeon wants to perform a particular surgery on a patient. We can’t really give that trainee surgeon access to real patients, but with the necessary equipment such as a HoloLens and haptic gloves, they can perform a virtual operation on a patient who may be designed to react in particular ways, such as the development of complications, that the learner then has to react to quickly. This is more interactive, cost-effective, and space-saving than many other potential alternatives such as using dummies and cadavers. Another example is that an architecture student might want to create a 3D model of a building and then enlarge it to so that he can enter it and wander its corridors. An excellent representation of AR’s possibilities was displayed at E3 2015 using the brilliant educational game Minecraft and the HoloLens. NASA has always been an organisation that has been an early adopter and creator of technologies that are later adopted more widely and it has been using the Hololens (AR) for virtual support for astronauts on the International Space Station. Funded via Jisc elevator, the Creating Augmented Reality in Education (cARe) app is an exploration of the potential that AR has for teaching healthcare students. In museums such as British Museum’s Ancient Egyptian trail or The Augsburg Display Cabinet experience at the John Paul Getty Museum, AR is being exploited to bring artifacts and history to life, making them more engaging and informative, particularly for younger visitors. The use of Virtual Reality and Augmented Reality in educational settings can provide crucial authentic educational training. STEM subjects and entrepreneurial avenues can benefit as AR and VR prepare the learners of today for the workplaces of the future with learning experiences that provide virtual collaborative spaces that make the world of academia even smaller. Imagine a global university where learners from all over the world attend a virtual campus and collaborate in new and innovative ways. These are the technologies that may finally lay to rest the notion that attending bricks and mortar institutions can provide so much more than that institutions online offerings. Not to mention that it’s all far more environmentally friendly than millions of foreign students flying all over the world every year, leaving the comfort of their family homes, and the potential resultant brain drain on their home country if they choose to remain in the countries where they study. The possibilities and the potential shifts in how much of what we know in relation to the dynamics of traditional experience may be turned on its head. More than once. In my next blog in this series on new and emerging technologies impact on higher education, I’ll be looking at Makerspaces.